Green World Group is one among the leading health and safety course provider which offers wide range of health and safety qualifications like NEBOSH, IOSH, IRCA Lead Auditor course etc. in major parts of India and few International destinations. Green World Group has a great reputation in educating health and safety courses since 13 successful years by constantly motivating fresher and safety aspirants to get high quality of education in health and safety and get placed in reputed Multinational Companies. Green World Group provides its valuable courses in 10 major cities of India like Chennai, Bangalore, Cochin, Mumbai, New Delhi, Kolkata, Patna, Hyderabad, Chandigarh and Ahmedabad. 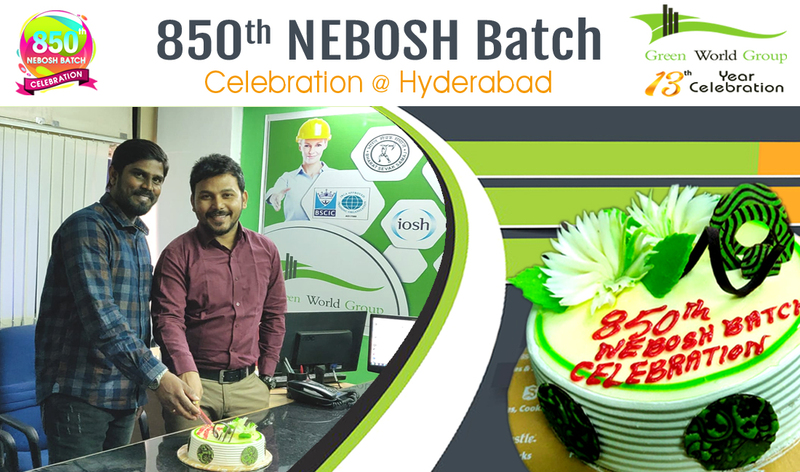 Green World Group has achieved a new milestone by completing NEBOSH 850 batches also enters into its 13th year of health and safety journey in Hyderabad. NEBOSH International General Certificate (IGC) is an excellent certificate level course which gives strong foundation in occupational health and safety which suites people who works in all kind of industry. This course can be taken by people who wish to take up health and safety as their career. NEBOSH IGC is 15 days course which provides various key aspects of occupational health and safety like principles of health and safety, identification of risk and hazard at workplace etc. NEBOSH IGC can be studied by any people with urge to choose health and safety as their career, people who already works in safety field, individuals with wish to gain knowledge in occupational health and safety. The skills and knowledge gained from NEBOSH IGC helps the people to eliminate potential risk and hazard at workplace.